We are available to assist your needs Monday through Friday from 8:00 am to 5:00 pm. Available after hours for emergencies at (336) 294-8258. Dr. Rankin is a specialist in his field. Therefore, our practice usually operates on a referral basis through your regular eye doctor or medical doctor. Patients are seen by appointment only. Should you need to reschedule an appointment that has been made, please let us know immediately. If you are disabled and require special help or accommodations please call and inform the receptionist prior to your appointment. On your first visit to our office and annually, please allow an extra 15 minutes to complete or update your current medical history forms. Because of the testing that may be necessary and care given each patient, allow a minimum of two hours for your appointment. Our office is equipped to provide same day evaluation and treatment of retinal disorders, therefore your appointment may last up to four hours. All minors having appointments must be accompanied by an adult. Please provide us with your insurance and personal information at the time of check in. After the appointment, your eyes will be sensitive to light due to dilation of your pupils. We will be glad to provide some dark shades for you, however, we recommend that someone accompany you to assure your safe return. Our primary concern is your health and visual status. Our fees for office exams, procedures, surgery, and follow-up care are based on the complexity of the treatment you need. Payment is expected at the time of your appointment. We accept cash, check, money order, Visa, MasterCard, and American Express. If you are covered by Medicare, we do accept assignment. Please remember that Medicare pays a percentage of the charges and you are responsible for the balance at the time of your appointment. Please remember the annual Medicare deductible. We will file secondary or supplemental insurance if you provide us with the information. We do not file 3rd insurance plans. As a courtesy, we will be glad to file your medical insurance for you, however, should your insurer fail to pay within 45 days, we will ask you to resolve the account and you will need to contact your insurance company for reimbursement to you. Your insurance is a contract between you and the insurance company – not our office. You are ultimately responsible for the charges for your appointments. The adult accompanying a minor is responsible for full payment at the time of the appointment. If you do not have medical insurance, we require that all non-surgical office visits and treatments be paid in full at the time services are rendered. For surgical procedures, 50% of the fee is expected before the surgery. We have several payment options available. If your eye problem is a result of an injury that occurred at your workplace, let us know when you make your appointment. We can complete workers’ compensation forms for possible payment by your employer. Should workers’ compensation deny the claim, however, you will be responsible for payment. If your eye problem is due to an accident, other than a work related one, we require you to make full payment at the time of your appointment to avoid delays in payment that may be due to long settlements of disputes. Due to the specialty of our practice, there are occasions when emergencies could cause a delay in the doctor’s schedule. If you have an emergency after normal hours call the main office number for the physician covering emergencies. 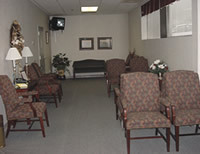 Our professional staff is dedicated to providing the highest quality patient care. They strive to make your eye care experience as pleasant as possible. In addition to Dr. Rankin, our practice consist of Ophthalmic Assistants, Billing and Insurance Specialists, and Medical Receptionists. Each member of our staff has extensive knowledge of retinal disorders, procedures and treatments ranging from 4 to 30 years of experience in the field of ophthalmology. We know that they will make every effort to provide excellent care during your visit. Experts disagree on which nutrients can prevent eye disease or reduce vision loss, and there are many studies being conducted to help us learn more about the relationship between vitamins, minerals and antioxidants and eye health. The general consensus is that the same things that are good for your body are good for your eyes: a healthy diet rich in fruits, vegetables and whole grains, drinking at least six glasses of water a day, regular exercise, and avoidance of cigarette smoke. Much of the research that has already been conducted points to the benefits of vitamins and antioxidants, specifically beta carotene (Dr. Rankin does not recommend vitamin A for any patient) , vitamin E, vitamin C, zinc, selenium, copper, manganese and lutein. The National Eye Institute’s recent Age-Related Eye Disease Study found that about one-fifth of patients with advanced age-related macular degeneration (AMD) enjoyed a decreased risk of vision loss after taking high levels of zinc and antioxidants. 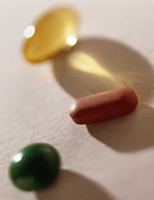 The study did not find a correlation between these nutrients and the prevention or amelioration of cataracts, but others are more optimistic and recommend multivitamins as preventative measures for cataracts, dry eye and glaucoma. Lutein is found in the macula, but it is not produced by the body. It can be found naturally in high concentrations in dark green and leafy vegetables, including spinach, collard and mustard greens, chicory, escarole, kale, lettuce, Swiss chard and turnip greens. Eating five or more servings per week (at least ½ cup per serving, cooked or raw) of these vegetables may reduce the risk or slow the progression of AMD. Patients taking the anticoagulant medication Coumadin should consult their doctors before increasing the amount of leafy greens they eat. View or Download our Patient Privacy Notice. This notice describes how medical information about you may be used and disclosed and how you can get access to this information. Please review it carefully.